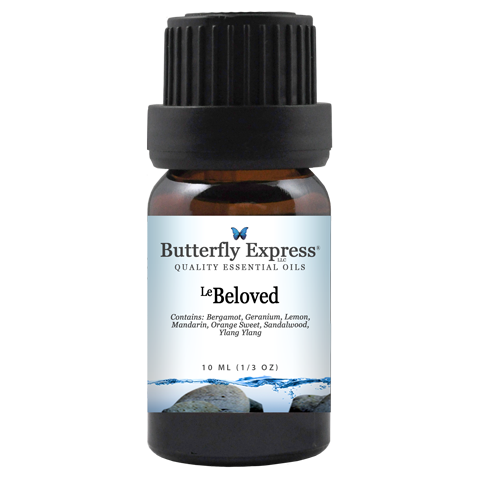 LeBeloved is helpful in developing inner strength and fortitude. The oils is this blend are of benefit when we are feeling overwhelmed or must accept changes in the circumstances of our lives. LeBeloved has been of value with mood swings and panic attacks. LeEverlasting promotes a most wonderful relaxation that is followed by high levels of optimism, vigor, and energy. The aroma balances energy and improves both mood and mental outlook. LeMoonlight sets a mood of connection to and appreciation for your romantic partner. LeMoonlight adds to the delight you feel in the sensual and passionate side of your lives together and creates emotional depth and bonding. Geranium regenerates tissues and nerves. It is excellent for skin disorders and skin care, and is especially nice for the skin of expectant mothers. Along with the essential oil blend LeDeeper, geranium heals the sores of shingles. Lavender can be used for nearly all skin conditions. It can be applied to cuts, sunburns, burns, rashes, dermatitis, eczema, and insect bites. Consistent use of lavender with burns and injuries minimizes scarring. The actions of rosewood are predominantly on the skin and the nerves, but like all essential oils, rosewood is antiseptic. Rosewood is useful for skin rashes, irritations, dermatitis, scars, and skin that has become dry and inflamed. Tinctures are a very convenient and easy way to use herbs. You can also buy the herbs and make your own tincture, or use the herbs to make teas, salves, poultices or compresses. The book Butterfly Miracles with Herbal Remedies has detailed instructions on how to use the herbs, and information on what each herb is for. Herbs feed the body, much like our food should but often doesn’t. They aid the body’s natural healing processes by providing essential nutrients. Herbs can be of value for every body system and cell. Nature has provided us with herbs which benefit the nervous system, immune system, respiratory system, muscular system, and digestive system. The properties of each plant target specific areas and functions of the body and accomplish very specific tasks. Herbs can and should be used every day for their nutritional value, not just when there is a problem. Check out our YouTube Channel for helpful videos on how to make herbal preperations. EMOTIONALl/PHYSICAL ASPECTS: LeExhilaration is especially beneficial in those situations which appear hopeless and discouraging. With the use of this blend we find our emotions strengthening and stabilizing until we are able to see new and different solutions to old problems. It is as if there are now several paths available to us, but we previously could only see one way out of the woods. Suddenly we are able to see our surroundings in a more comprehensive way. LeExhilaration is also used to release emotional blocks and help us let go of negative feelings and perceptions. PHYSICAL ASPECTS: Cistus is used in skin care regimens, for the prevention and minimization of wrinkles, and in the treatment of skin disorders such as psoriasis and eczema. Because of its regenerative properties, cistus has also been used for many years in the treatment of wounds, abrasions, and boils. EMOTIONAL / SPIRITUAL / MENTAL ASPECTS: The high notes of citrus add happiness and cheer to this blend while the vanilla C02 and Benzoin add stability and deep contentment with its warm welcoming velvety richness. It is a very grounding blend bringing feelings of peace, joy, and contentment. It promotes feelings of love and gratitude for our partners making it a great oil to add to those special moments with your Valentine. The Better Half Kit is designed to focus on and spoil your better half. Diffusing LeTranquility or LeUnity will help the atmosphere become more relaxing, relieve stress and help relationships grow stronger. Use this kit to build understanding and tolerance. This kit also contains some great massage oils like LeIntensity and LePaine. Everything you need to pamper your Better Half. The Better Me Kit is specifically for depression. It focuses on taking time for and care of yourself. This kit includes two of my favorite essential oils for depression, LeHeartSong and LeVitality. They are great for the diffuser, applied to the skin, or in the tub. This kit also contains vitamins and minerals to help improve nutrition. Nutrition often plays a part in depression. Marula oil is noted for its remarkable absorbency into the skin without leaving a greasy residue, and is packed with essential fatty acids, antioxidants, vitamins, and minerals. Marula oil is gaining popularity for its ability to nourish, moisturize and improve skin elasticity. Marula oil can help reduce the appearance of scars and stretchmarks, and helps prevent them from occurring in the first place. It is beneficial for skin disorders like eczema and pigmentation discoloration, and can even help fight acne due to its antimicrobial properties. Marula oil also helps protect and nourish hair and nails. Apricot kernel oil is light in color with a pleasant, slightly nut scented aroma. It is appropriate for all skin types, but especially effective for sensitive, inflamed, dry, or prematurely aging areas. Apricot oil is readily absorbed by the skin and leaves very little greasy residue. It is generally non-irritating, making it appropriate for children and infants. There are reports of the benefits of apricot kernel oil for treating mild sunburns.